We offer many different types and models with different cost levels with still the very best quality. These are the best, high quality trunnion hinges on the market. These are built as a good corrosion resistant﻿ material to prevent rust﻿﻿ along with being very quite while opening and closing the tailgate. These are manufactured machined 303 stainless steel and Delrin. They are made to fit your stock and remaufactured tailgates. No need for greasing the trunnions any longer. There could be some small modifcations you might need to make your Delrin bearing to make it fit correctly in your tailgate. 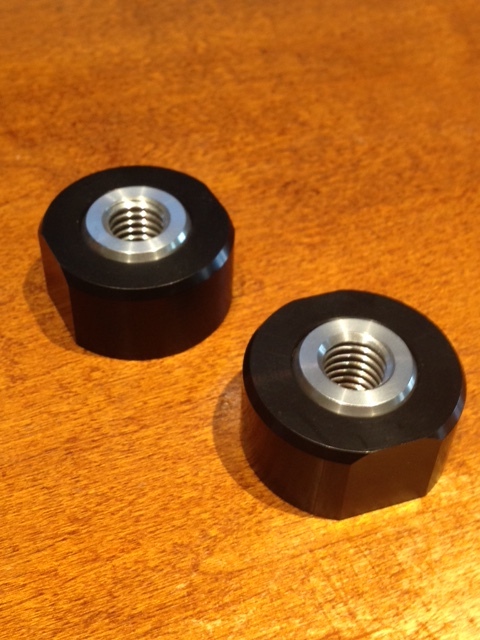 These come with a little﻿ anti-seize lubricant﻿ on threads. Please note:These above do not include the bolt or lock washer! 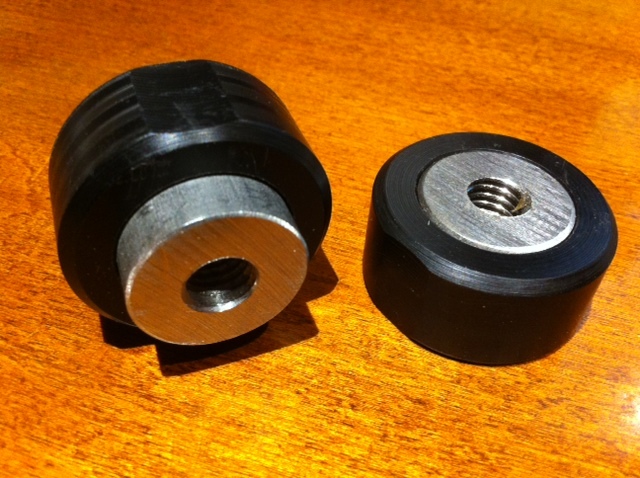 You can reuse your original bolt and washer or replace them. I also highly recommend using additional stainless steel anti-seize lubricant while installing these items. Very smiple installation instructions will be sent with the product. 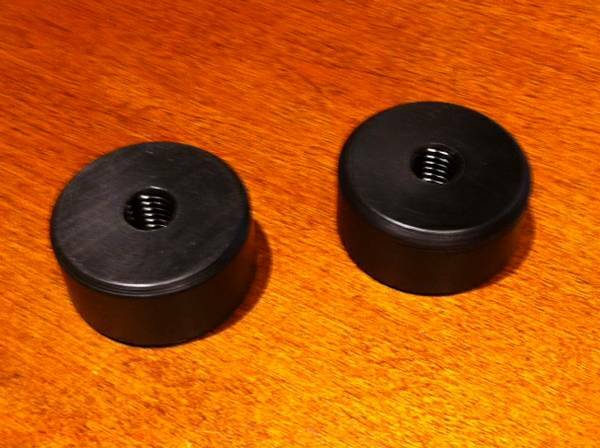 These are highest quality trunnion on the market. These are built as a good corrosion resistant﻿ material to prevent rust﻿﻿ along with being very quite while opening and closing the tailgate. These are manufactured machined 303 stainless steel and Delrin. They are made to fit your stock and remaufactured tailgates. There could be some small modifcations you might need to make your Delrin bearing to make it fit correctly in your tailgate. Installation instructions are sent with your item. Please note:These above do not include the trunnion hinge plate, bolts or lock washer! I also highly recommend using a stainless steel anti-seize lubricant while installing these items. You must reuse your original Trunnion hinge plate/bracket with all of these replacment parts. I recommend power coating or chrome your Trunnion hinge plate before installing these back on your truck, to prevent further rusting. 58-66 Chevy/GMC Fleetisde truck with SS hinge plate - Complete kit! 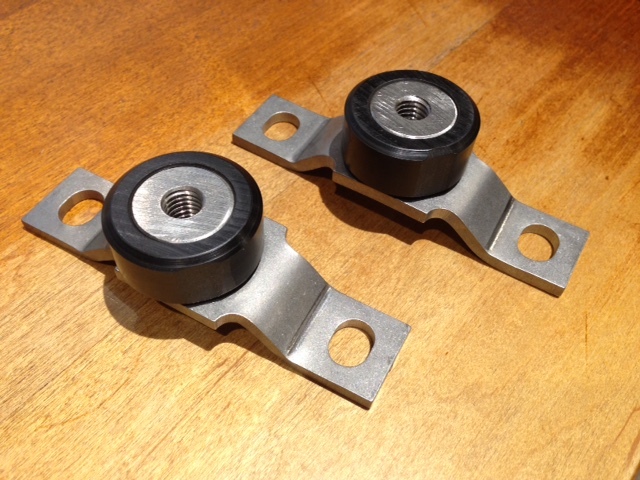 These are the highest quality trunnion hinges set on the market today. These are built as a good corrosion resistant﻿ material to prevent rust﻿﻿ along with being very quite while opening and closing the tailgate. These are manufactured 304, machined 303 stainless steel and Delrin. They are made to fit your stock and remaufactured tailgates. There could be some small modifcations you might need to make your Delrin bearing to make it fit correctly in your tailgate. See the installation instructions at the bottom of this page. 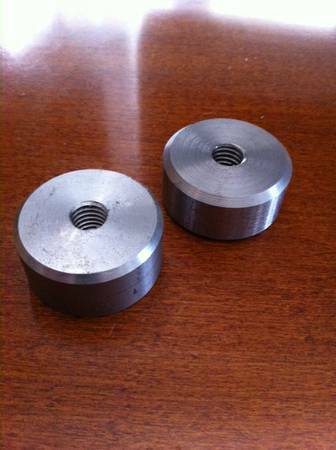 These include Trunnion's (6piece set), (2) trunnion balls/delrin bearing, (2) hinge plates, (2) bolt, lock washer! You will need to re-use your original mounting hardware or purchase new hardware. $63.00 Trunnion Hinge complete set ﻿﻿ Very smiple installation instructions will be sent with the product. I also offer replacement hinge plates. These are laser cut ﻿made of 304 stainless steel. 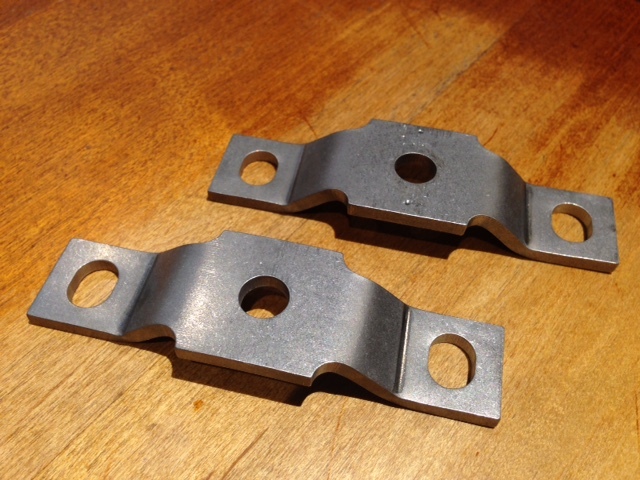 These are the highest quality trunnion hinges set on the market. These are built as a good corrosion resistant﻿ material to prevent rust﻿﻿ along with being very quite while opening and closing the tailgate. 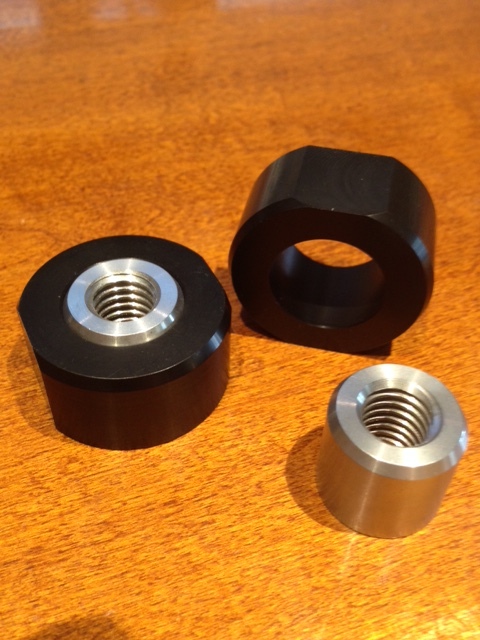 These are manufactured 304, machined 303 stainless steel and Delrin. They are made to fit your stock and remaufactured tailgates. There could be some small modifcations you might need to make your Delrin bearing to make it fit correctly in your tailgate. See the installation instructions at the bottom of this page. ﻿﻿﻿﻿﻿﻿﻿﻿﻿﻿﻿﻿Silent Trunnion Hinge: These are made of Delrin, which is made of crystalline plastic ideal for many industrial wear. This makes it perfect for this application its quite while opening and closing the tailgate. These are built the same size as the original trunnion ball. See further details on the Material below this poage. $15.00 Please note:These above do not include the bolt or lock washer! You can reuse your original blot and washer or replace them. ﻿﻿﻿﻿Better than Factory original design! Stainless steel Trunnion Hinge: These are manufactured stainless steel made from (303 stainless steel) trunnion replacement parts. These are built the same size as the original trunnion ball. Protect your chevy truck from further rust. These will make some noise while opening a closing your tailgate but a very good corrosion resistant﻿ material to prevent rust﻿. Please note:These above do not include the bolt or lock washer! You can reuse your original blot and washer or replace them. I also recommend using a stainless steel antilock lubricant while installing these items. All Stainless steel parts are made of 303 Stainless Steel is very similar in properties to that of 304 Stainless Steel, However 303 has an addition of sulfur for better machining characteristics. 303 Stainless Steel is Corrosion resistant to temperatures of 1500 Degrees or more. It is used in screw machines, food processing equipment, marine applications, and some aerospace application. 303 offers a good corrosion resistant﻿ to reduce rust. Please send an email or ﻿vist the contact us with a message or request to order including your address and your payment method. We do accept PayPal and personal checks. If your option is PayPal, I will then direct you to our PayPal address for payment. please note: The product will ship after check clears at the bank. All Shipping flat rate USPS in 50 states. $7.50, international shipping will be extra charge, please ﻿contact us on shipping. ﻿ Pending products in the near future. After removing your tailgate from the truck you will have two (2)trunnions hinges, one for each side. Remove the bolt from each the hinge plate and replace each trunnion ball/pivot with the new Stainless steel Trunnion ball/pivot. Besure to use antilock/stainless steel lube so you would beable to remove to bolt in the future. On the tailgate before installing the the female delrin. Make sure all debri, paint, dirt, etc is removed and clean before Installing. 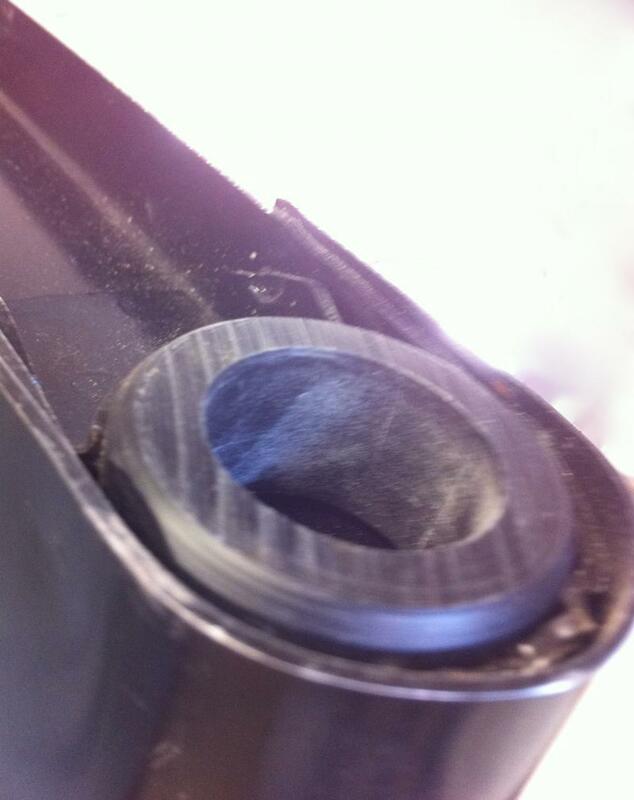 Install the delrin bearing flush with bevels on the outside at each end of the tailgate as seen in the picture below. Each tailgate could have changes over the years so there might be small modifcation to make to the delrin part so it would fit correctly and flush. (minor sanding or grind to make it fit properlely) Might need to tap it into place with a light hammer. It shouldn't fit very tight, just enough so it won't turn in place. The flat edges prevent it from spinning or turning in place. Instructions will be sent with the product for further help.